Cover of "The Right Stuff," the famous 1979 book by Tom Wolfe. Tom Wolfe, who wrote "The Right Stuff" and a number of other iconic books, died yesterday (May 14) in New York City at age 88. Wolfe had been in the hospital battling an infection, according to The New York Times, which published a detailed obituary of the flamboyant and innovative journalist-turned-novelist today (May 15). In "The Right Stuff," Tom Wolfe chronicled the lives and missions of NASA's original "Mercury Seven" astronauts. 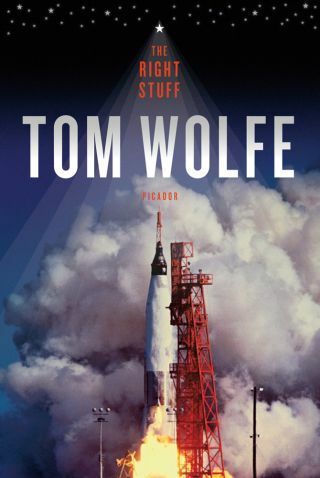 Wolfe's most famous nonfiction works are "The Electric Kool-Aid Acid Test," a 1968 book that put readers on the bus with counterculture legend Ken Kesey and his band of Merry Pranksters, and 1979's "The Right Stuff," which chronicled the early days of the United States' human-spaceflight program. "The Right Stuff" profiled NASA's first astronaut class, known as the Mercury Seven, as well as some test pilots who never made it to space — most famously, Chuck Yeager, who in 1947 became the first pilot to break the sound barrier. The best-selling book was made into a 1983 movie, which won four Academy Awards and has become a cultural touchstone in its own right. "I'm saddened to hear of the passing of legendary author Tom Wolfe. "The Right Stuff" was an inspiration to me and millions of others. He will be missed," NASA Administrator Jim Bridenstine tweeted today. Wolfe was a prolific essayist who published many pieces in prominent magazines such as Esquire and Harper's. He became a successful novelist relatively late in life, publishing "The Bonfire of the Vanities" in 1987 (though the book first appeared in serial form in the magazine Rolling Stone in 1984 and 1985) and "A Man in Full" in 1998.